Travel Luggage Options - What Kind Of Luggage Is Best For You? Backbacks? Suitcases? Hard or Soft-sides? Travel luggage options run the gamut from backpacks to matched sets of luggage. When you go out to buy luggage, first take into consideration your travel style. ...or only once in a while. ...with all of your luggage handled for you? Or will you be handling your own luggage the whole trip? The way you travel and the way you pack will help you figure out which travel luggage options are good for you. There are all kinds of bags available. 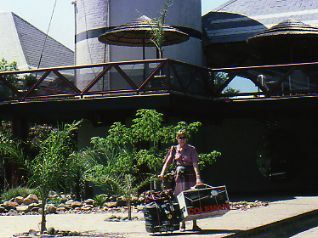 Hopefully, you'll never be carrying a large ice chest in a box like we did one time on a trip to Africa! The most popular bags right now seem to be soft-sided bags… at least they seem to be the most common. Soft bags won't get dented if you check them and they get thrown around… They absorb the shock better than hard sided ones. And they are more compressible, so you can squeeze them into tight spaces better… like in those overhead bins on the plane. Soft sided suitcases come in all sizes from carry-on size to "moving day" large. Watch those expandable zippers... Some of the smaller, carry-on size bags can have an expandable zipper. Generally if you expand those bags, they no longer meet the carry-on size restrictions. With or without wheels. They can come with wheels or without. Almost everyone today chooses wheels... that's because almost everyone is trying to carry their bags on with the fees to check bags. Day Pack Attached - You can also get some with a "zip-off" day pack attachment. Most of the soft sided bags that you see look like suitcases, but they can also be duffel bags or backpacks. Some soft-sided suitcases come with straps that can be zipped away…. You can wear the suitcase as a backpack if you have to walk from, say, a train station to your hotel. Sort of the best of two worlds. Backpacks are good if you want to go hosteling or if you are going on an adventure trip. Large backpacks will have to be checked, but some smaller ones can be carried on. Duffel bags used to be something that you would only take to the gym. Some of the new ones come with wheels. They can be good if you're going camping or on a casual trip, but we think they're hard to pack. Here's an interesting little fact I only learned when I was trying to find out the spelling... is it duffel bag or duffle bag? It can apparently be either, but according to Wikipedia , the name came from Duffel, a town in Belgium where the thick cloth used to make the bag originated. Who knew? We've always traveled with hard sided bags. These can protect fragile items packed inside better than soft sided bags, but they don't flex to pack that extra shirt as easily. Some hard sided bags close with traditional latches, others zip closed. We do have some travel buddies that have small hard-sided bags with zippers to close them, and zippers to expand them like some soft sided bags have. The bags we like the best are carry-on size, hard sided bags that open in half. We divide our clothes up so we each pack one half of our things in each bag. That way if one bag ever gets lost, we always have enough to get by for several days. The only time we almost lost a bag was when one "walked away" on a trek in India…. but it was returned within hours by the Indian Army. Travel Luggage Options - Airline Rules? In the U.S. and most of the world, you are allowed to carry one piece of luggage and a "personal item". Think about how the luggage you choose will fit those rules. That personal item can and should carry your essentials. 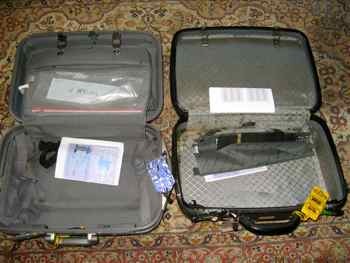 Remember that when you fly in some foreign countries, your carry-on limits are lower. Whatever travel luggage options you choose, we think you should worry less about making a statement with fashion luggage than in finding something that works well on your trip and will last for many trips to come.